Built in 1922, the James Administration Building was originally home to the Department of Biology. Although the Department moved out many years ago, a stone frog above the front door is a reminder of its past. 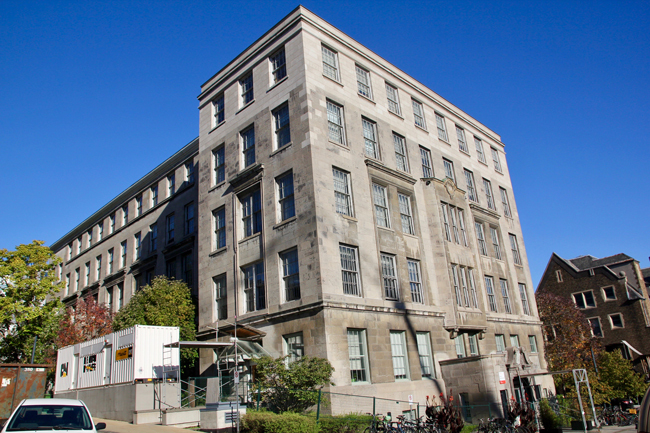 In the 1920s, the expanding Biology department required more space and the University erected a limestone building on the site of the old medical building, which had been lost to a fire. The McGill crest at the new building’s entrance was adorned with an ornamental frog to signify the work being done inside. Eventually requiring even more space and modernized laboratories, Biology left the building in 1965 upon construction of the Stewart Biological Sciences Building on Dr. Penfield Avenue. The old building was renamed the James Administration Building after former McGill principal F. Cyril James and houses the Principal’s Office, among other administrative units at McGill. For years, the frog has been a target of pranksters from other universities visiting for sports events and is frequently painted purple by Bishop’s University students.